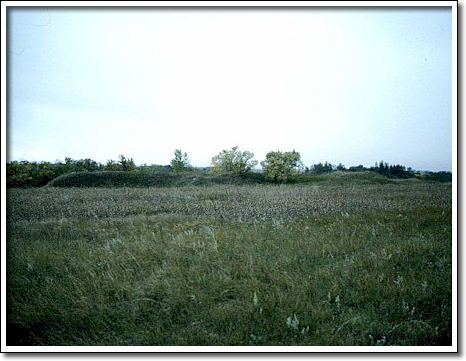 The Arden Camp Site, located within the Village of Arden, contains the remnants of the most northerly Aboriginal burial mound in Manitoba. The mound had a large centre section (over one metre in height and 20 metres in diameter) with a "tail" that extended to the southeast for more than 135 metres. The mound is considered to be one of three effigy mounds (that is, a mound built in the form of an animal) recorded in the province. The form has been interpreted as a beaver. The mound was constructed on a prominent gravel ridge, a former shoreline of glacial Lake Agassiz. The camp site was located west of the mound and extended down the beach ridge to the Whitemud River. There are no known dates for the construction of the mound, or occupation of the camp site, although a metal knife blade, reportedly recovered approximately 80 centimetres below the surface of the mound, suggests that it may date after the arrival of Europeans. Today, the only visible remnant of the mound is a reconstructed tail and midsection.